If you think that having American aircraft and aircrew fly off of a Royal Navy aircraft carrier is something new with today's F-35B and the HMS QUEEN ELIZABETH (R08), then let me introduce you to the HMS VICTORIOUS when the US Navy ebb tide in the fall of 1942. In autumn 1942, Adm. Ernest J. King, the Chief of Naval Operations, faced a dilemma: The battles of the Coral Sea and Midway, and the still-ongoing Guadalcanal campaign had severely weakened the U.S. Navy’s fleet carrier presence in the Pacific. USS Lexington (CV 2) had been lost at Coral Sea, USS Yorktown (CV 5) at Midway, and Hornet (CV 8) during the Battle of Santa Cruz Islands. USS Wasp (CV 7) had been torpedoed and sunk south of the Solomons in September. Although she remained operational, USS Enterprise (CV 6) had been repeatedly damaged during the naval engagements around Guadalcanal and would eventually require repairs at a U.S. shipyard. USS Saratoga (CV 3), which had also been damaged in the Solomons, was undergoing repairs at Pearl Harbor. USS Ranger (CV 4), despite taking part in the Allied landings in North Africa in November (Operation Torch), was not deemed suitable for combat in the Pacific. The first new Essex-class carriers were not expected to join the fleet until late 1943. 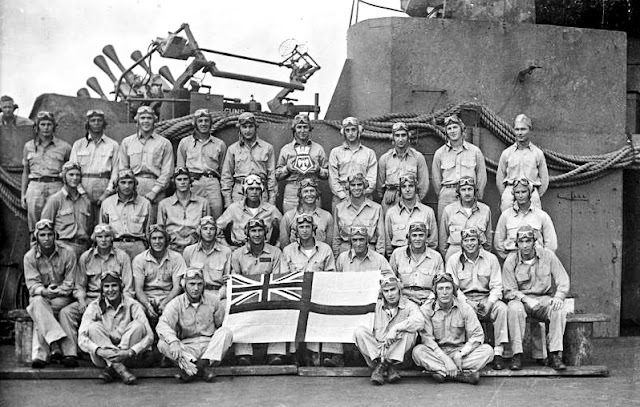 Immediately following the Battle of Midway, King had requested assistance from the British Admiralty for the U.S. Pacific Fleet, but the Royal Navy’s flattops were heavily engaged against the Germans in the North Atlantic and Mediterranean at the time. Now, he again approached the British with a similar request, one that quickly made its way into communications between President Franklin D. Roosevelt and Prime Minister Winston Churchill. 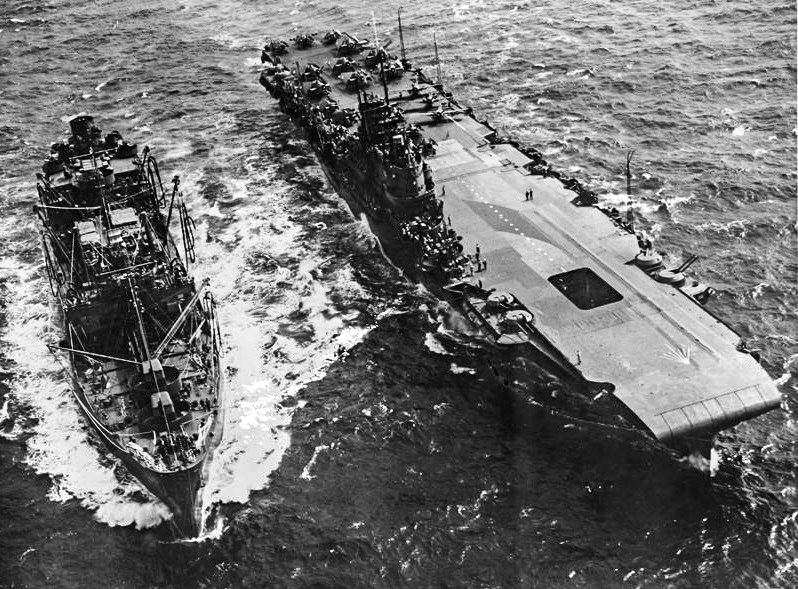 Despite its continuing heavy operational commitments, the Royal Navy detached the carrier HMS Victorious from the Home Fleet for service with the U.S. Navy. After a hasty replenishment at Greenoch, Scotland, Victorious departed British waters on Dec. 20, making a brief stop in Bermuda, and arriving in port at Norfolk, Va., on the last day of 1942. At Norfolk, Victorious was dry-docked from Jan. 1-31, 1943. On May 17, Victorious reached Noumea, New Caledonia, and joined Saratoga in Rear Adm. DeWitt Ramsey’s Carrier Division 1. As part of Rear Adm. Forrest P. Sherman’s Task Group 36.3, the carriers left Noumea on June 27 to take part in Operation Toenails, the invasion of New Georgia. The Task Group was not involved in the amphibious landings themselves, but instead remained on station for 28 days to provide air cover for the transports and landing force. Victorious’s crew’s extensive training in U.S. procedures and the mutual exchange of practical experience paid off as U.S. and British sailors kept patrol aircraft in the air for nearly 12 hours per day. On July 31, “Robin” detached to rejoin the British Home Fleet by way of Pearl Harbor and Norfolk, where her U.S. Navy communications, radar, and flight operations gear were removed. Victorious returned to the Pacific in early 1945. As a component of the British Pacific Fleet, she took part in Operation Iceberg, the invasion of Okinawa, where, on May 9, she was struck by two kamikaze aircraft. Her armored flight deck absorbed the blows and, despite fire damage, she resumed flight operations within hours of the strikes. In contrast, the unarmored Essex-class carriers USS Franklin (CV 13), severely damaged by a kamikaze in March 1945, and USS Hancock (CV 19), hit by a kamikaze during Iceberg, had to withdraw completely from combat operations. Of note: All U.S. Navy carriers in use since World War II have had armored flight decks.